daß sie eine Menschenmenge wurde. in einen Fächer von Frauen. nicht mehr beim Friseur gewesen war. sich in dieselbe Richtung schleppt? wir sind die Menschenmenge, die Mutter heißt. steht, und winkt, ist eine von uns. 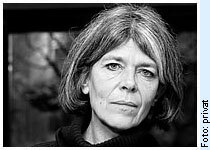 Anna Enquist (1945) made her debut as a poet in 1991, and now has eight collections of poetry to her name. She received the C. Buddingh Prize for her first publication Soldatenliederen (Soldiers’ Songs), and the Lucy B. and C.W. Van der Hoogt Prize for her subsequent collection Jachtscènes (Hunting Scenes). Her volumes of poetry have reached an exceptionally large public, as have her novels Het meesterstuk (The Masterpiece, 1994) and Het geheim (The Secret), selling over 100,000 copies. Enquist combines writing with her work as a psychoanalyst. In an interview Enquist herself made a link between her psychoanalytical work and her poetry. In both cases, explained the poet, it is a question of finding a balance between analysis and feeling. The poet exlpores the bilingualism between technical and emotional language. The enormous response provoked by her work and the prizes she has received for it testify to her having succeeded in striking a balance between the two. Enquist writes lucid poems, about growing older, motherhood, seeing time slipping through your fingers and the helplessness of not being able to do anything about it. However, the tone of her poetry is fierce and dogged. Enquist’s poems have been published in translation in eleven countries, among which Germany, England, France, Spain and the US. More information on the poet and her work - on the "Foundation for the Promotion and Translation of Dutch Literature"'s website.